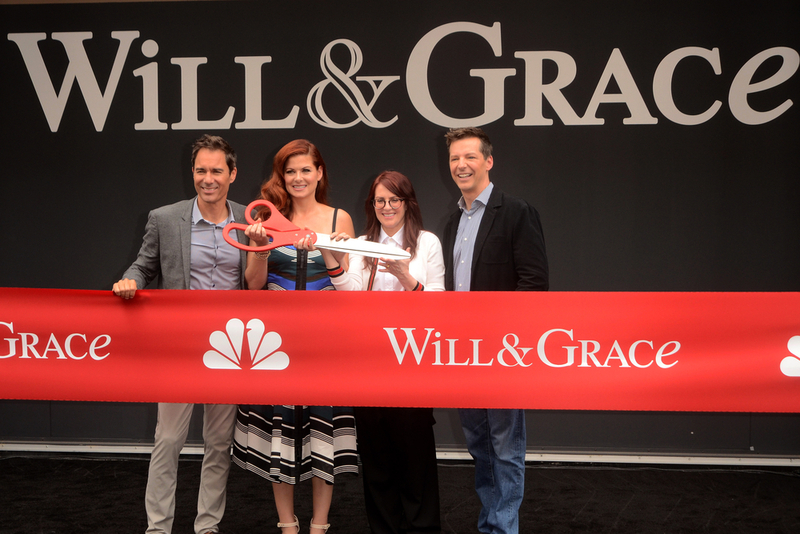 The cast of “Will & Grace” kick off the 2017 season at Universal Studios. Will & Grace, the early 2000s sitcom about how gay people (well, affluent white gay men) are just normal people living normal lives, is back on air. The producers have erased the show’s 2006 finale as “just a dream” and stepped back into the lives of Will, Grace, Jack, and Karen as if we never left. The first few episodes of the new, ninth season which aired in September push hard to set themselves firmly in 2017. Jack considers Botox, though not for his face. The Trump administration gets more than a passing mention. Rapid-fire quips name-drop all the recent politico-humor heavyweights. The humor is still good. Better, perhaps. Gone are the jokes about predatory lesbians and “transsexuals” (at least so far, let’s keep our fingers crossed!) Will has matured, and has a very nice scene educating his younger date about the intersections in LGBT history and the importance of pop culture to ’90s gays. Grace has not, and admits that her election-day activism has disappeared down her Facebook feed. That’s not to say the show’s become preachy. What was good about it is still good; it’s light, airy, and doesn’t need to be read into deeply. In a larger context, however, the show seems very unnecessary. “It’s just like Friends, but gay!” isn’t a selling point in 2017. Nostalgia may have given Will & Grace one final tour, but it’s unlikely it’ll carry it further than that unless the show finds something real to say. If they’re taking suggestions? Maybe use that nostalgia pedestal to make a statement about how precarious the lives of many LGBT Americans still are. Just one conversation from Will about having to turn down job offers in states where he has no employment or housing protections. That’s all it’d take to bring this show to earth.